Established in 1947, AACCSA is a voluntary, non-governmental, business membership organization with more than 15,000 member companies. The chamber serves as a credible voice of business and advocates for the creation of a conducive business environment. It also promotes trade and industry, disseminating business information, consulting government and members on economic development and business issues, establishing friendly relationship with similar chambers in other countries, and exchanging information as well as engaging in arbitration in times of disputes among businesses. 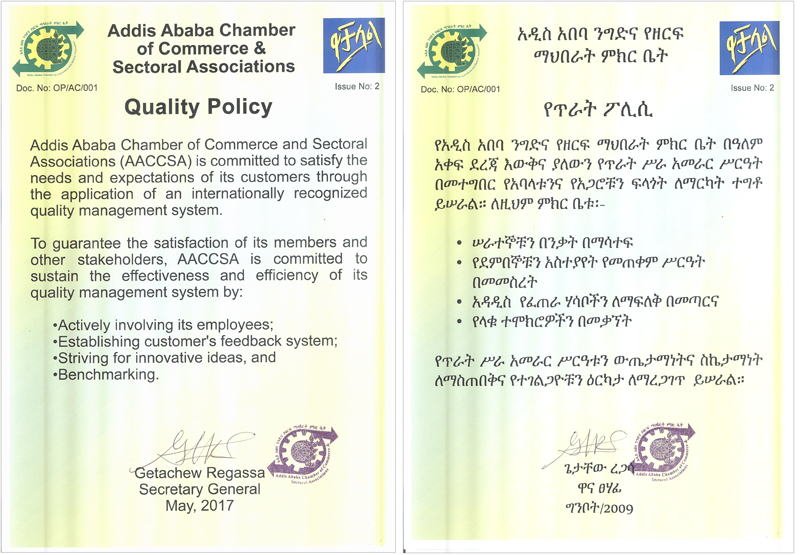 AACCSA is the oldest, largest and strongest Chamber in Ethiopia, representing a wide spectrum of businesses based in Addis Abeba which constitute more than 60% of all businesses operating in the country. Being a member of the World Chambers Federation, AACCSA also has a prominent place in the international network of chambers. AACCSA’s Core Values – are the heart of all that it does and are reflected in the day to day activities of AACCSA are promoted consistently by the Board and staff. AACCSA is engaged in the following range of activities categorized under business Advocacy and business development services. Builds capacity by providing different short term trainings. Issues testimonials and authenticates businesses documents to boost credibility of companies. Implement ISO-Management systems and assists companies to acquire internationally accredited ISO Certificates. Is the supreme organ of AACCSA. AACCSA consists of 3 institutes, 7 departments and 5 service units, with a branch office in Merkato.